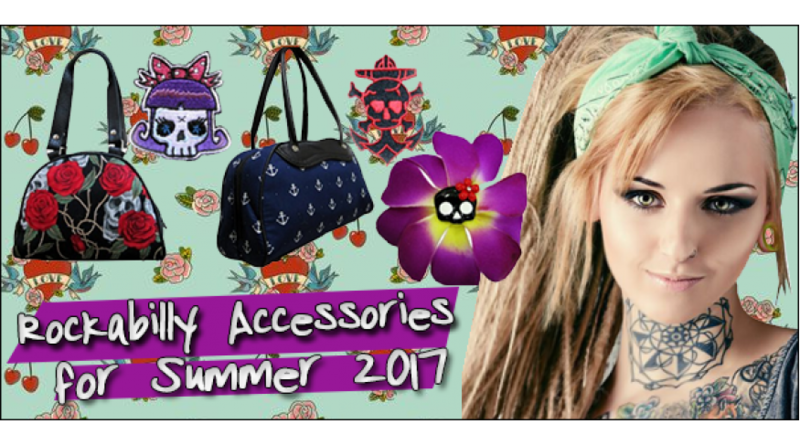 Summer is upon us, which means it's the perfect time to start decking our in rockabilly and punk rock accessories. We have a wide selection of everything you need to complete your punk rock outfit. Here are some of our favorite rockabilly accessories for summer. This one is for all our punk rockers and rockabilly greasers out there. Rockabilly body jewelry is here to stay. We have a great selection of punk-themed body jewelry with skulls, checkered prints, cherries, and gambling dice. Pair with jeans and a rockabilly men's t-shirt, or wear with studded punker pants and an open vest! Every pin up girl has a favorite rockabilly accessory - her purse! Use our rockabilly purse to store your hair pins, cell phone, and that perfect shade of ruby red lipstick. This purse is made sturdy, perfect for carrying all of your necessities for a summer night on the town! Head bangers and punkers, this one's for you! Deck out your clothes with our rockabilly accessory of punk and pink themed bracelets! Wear one and show off your love for your DIY musical culture or cover your jacket front to back with these iron on patches for that true punk rock edge. Dress our flower hair pins up with one of our rockabilly dresses or dress it down with jeans and sneakers. No matter what your style, our hair flowers will make you shine.